Craving chocolate and cheesecake? 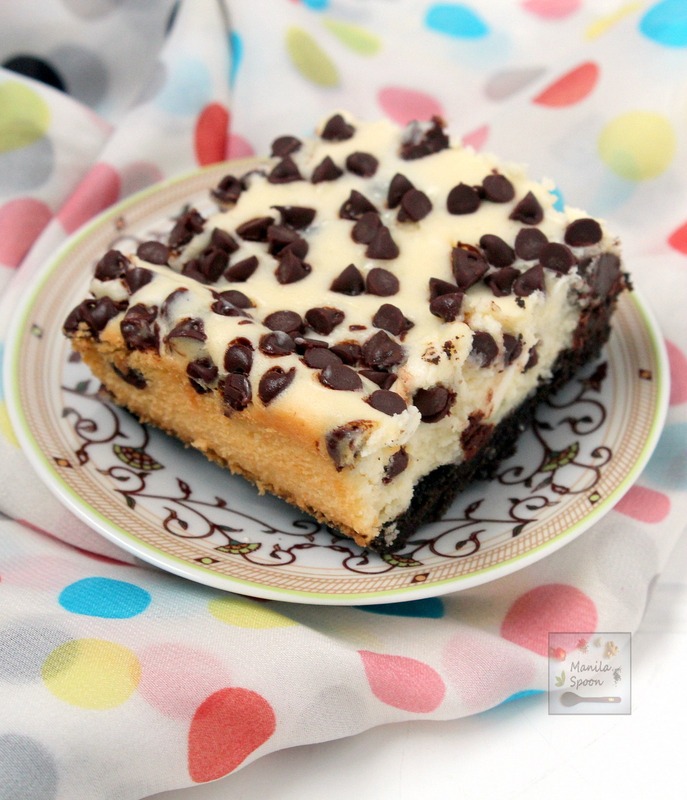 These delicious choco chip cheesecake bars are the solution! 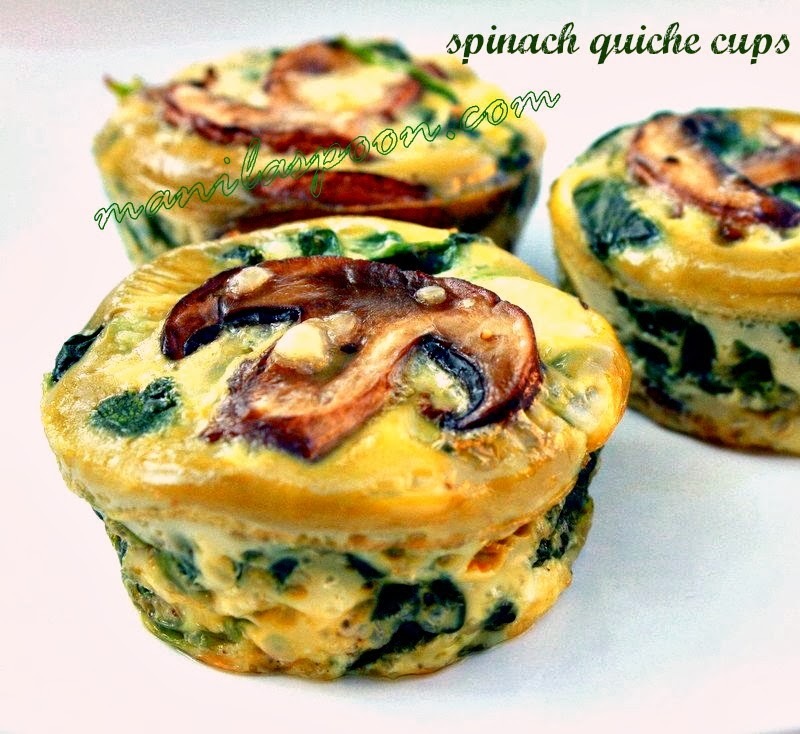 Easy recipe that you will make again and again. Anyway, last weekend I experienced some strong craving for chocolate so I went with my daughter to the nearby deli and we purchased some choco chips which I initially planned to use for a pound cake that I imagined would burst with chocolate goodness! However, when I opened the fridge to get some eggs for the cake, I saw 3 blocks of cream cheese in the corner which I had been snobbing for several weeks for some reason. I looked at the expiration date and saw they still had over a month to go but I thought perhaps I needed to use them soon otherwise I would forget (which I often do) and it would be such a shame to later on throw away all these cream cheese. So from chocolate pound cake it became chocolate cheesecake. Thankfully, everyone (both family and friends) who received a bite of these delectable bars came out truly happy. And, how can you not when these chocolate cheesecake bars are loaded not only with cheesy goodness but also chocolaty yummy-ness all over it! Enjoy! Mini-chocolate chips float on top of the cheesecake and in the middle you get another burst of chocolate from extra chocolate chips! Double chocolate goodness in every bite for sure. Preheat the oven to 325 F. To make the crust combine the crushed oreo cookies and the melted butter in a bowl and mix until evenly moistened. Press the crumb mixture into a lightly greased 9 x 13 baking dish. Bake in the preheated oven for 10 minutes. Take out of the oven and set aside while making the filling. Using an electric mixer, beat the cream cheese in medium speed until soft, creamy and completely smooth (no lumps). Add the sugar slowly and continue to beat until the mixture is smooth. Add the eggs one at a time (this is very important) beating well after each addition. Pour in the vanilla extract and beat again until it’s well mixed. Frequently scrape the sides of the mixing bowl to ensure that there are no lumps remaining on the side or at the bottom. Patience is the key here – it may take awhile to do all the above but the result would be a very silky smooth cheesecake and not a lumpy one. Fold in the semi-sweet chocolate chips (leave out the mini ones for now). Spoon the cream cheese mixture into the prepared crust. Sprinkle the mini chocolate chips all over. Bake in the oven for 40-45 minutes or until set. Cool completely and refrigerate. Make a day or 2 ahead. Slice into 24 bars and serve. I am always craving chocolate and cheesecake! We make quite a lot of dessert at home, but we never make cheesecake. I am going to have to change that! Hope you enjoy this! Thanks, Dannii! These cheesecake bars look pretty easy to make. I just may have run out of excuses to bake. Scrumptious!! Those mini chips make everything so CUTE! I wasn't Craving chocolate and cheesecake before, but I certainly am now! This looks so delicious! I wish I had a slice or two right now! Oh my gosh this looks good! My hubby would be delighted to eat a whole pan of this dessert by himself! We love cheesecake bar desserts like this! 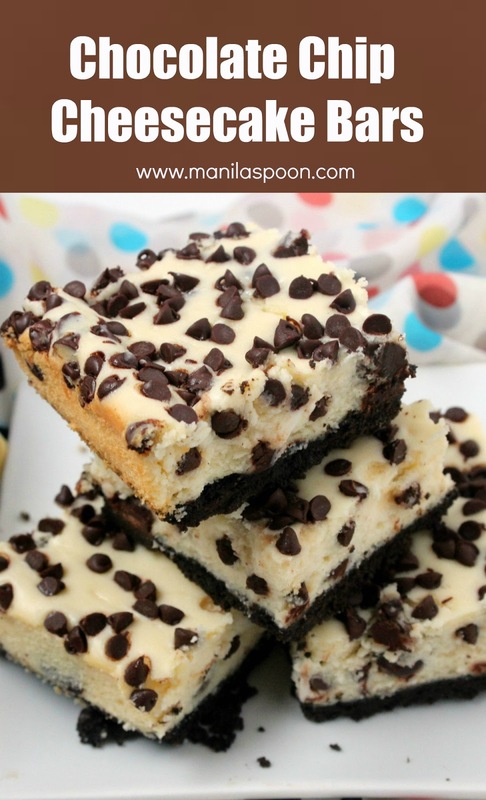 Love the idea of making cheesecake bars, and of course the chocolate makes it a win! win! I have been craving something but it's been non-specific, the second I saw this, I knew this is exactly what I wanted! The double dose of chocolate chips would thrill my family! What fabulous cheesecake bars! Abby, I am a serious lover of chocolate chips and cheesecake and absolutely cannot wait to try your recipe! I might just whip these for our Memorial Day BBQ! One of my favorite flavor combinations!! Id love to have one right now!! These look SO divine!!! I want like eight pieces. The chocolate chips do not look like they were baked. Did you actually add them before you baked the cheesecake? Also, could I use holiday chips to look festive (Christmas)? You can pour it while warm or cold or at room temp. Whichever you prefer but certainly before you serve it and simply allow to set first. Thanks!